To rule the budget phone market, Intex brings you latest budget smartphone, the all new Intex Aqua power+ with powerful 4,000mAh battery, Android 5.0 Lollipop, 13-MP+5-MP Camera which is available in India priced at Rs. 8,999 in White, Black, Blue and Grey. It terms of battery Aqua Power will give stiff competition to the mid-range smart phones like Lenovo P80, Lenovo A5000,Lava Iris Fuel 60, and Xolo Q3000. Intex has recently launched all new Intex Cloud Power+ in India at Rs 8,5999 which identical to Intex Aqua power+. The all new Intex Aqua power+ offers you a a 5-inch HD display with resolution (720×1280 pixels) and colour depth RGB/16.7m promising crystal clear view from every angle while latest Android 5.0 Lollipop and powerful 1.3GHz Quad-core processor capable of revolutionizing your multitasking. Aqua Power’s 2GB RAM, 16GB ROM and 32GB external memory allows you to store your favourite songs, movie and games. Intex Aqua Power Plus also offers you a 13-MP Primary camera with LED flash with Smart Camera Feature –Panorama Shot,face Beauty,Live Photo Mode,Contineous Shots,Voice Capture ,HDR,Smile Shot,Face ditection,Zero shutter delay,capture by volume up & down key,capture by earphone which allows you take the photo in low light condition and 5-MP secondary front camera for video calling and selfi. Intex Aqua power+ is powered by most powerful 4,000mAh battery with Smart features – Fast Charging promising Talk Time up to 20 hrs and Standby Time 1176 hours measures 147mm x 72mm x 8.65mm weight 156gm. It also supports dual-SIM (GSM+GSM), 3G, GPRS/ EDGE, Wi-Fi 802.11 b/g/n, Micro-USB, and Bluetooth. Intex Aqua power+ Power Bank feature by OTG support, Free Replacement on one time breakage of Screen for One Year, Pedometer, Smart Air Shuffle, FM recording, LED flash, Clear motion, E-Compass. 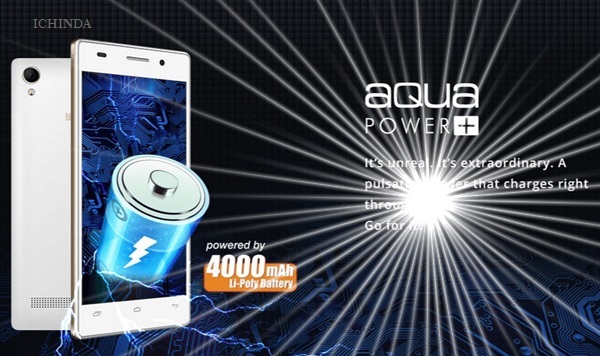 Intex Aqua power+ Rivals Lenovo P80, Lenovo A5000,Lava Iris Fuel 60, and Xolo Q3000. At last Few honest word, that all new Intex Aqua power+ is the best smartphone for multitasking. What you think? Please be open to give your view. This is the fouth Intex smartphone in my kitty, earlier I have experienced Intex Aqua Wonder, Aqua i4+, i5 HD and finally move to this new gadget. Truly saying every phone before this I have used had some small problems like unavailability of flip cover, battery problem and sometime faced issue with speed too, but Since from the day I have started using this one it made my opinion change about Intex brand. Kudos to Indian brand… Finally you have made it. Last but not the least it worths and I would recommend to go for it. I already have HTC Desire 820 which I bought for 23 K for my wife. I wanted to make sure that my mobile should be at least comparable to HTC. I was willing to sacrifice for the camera performance. If I had to go for better camera performance I should purchase Sony, HTC or Samsung where I would end up losing on my requirements keeping in mind my 10K budget. I have purchased the mobile through ebay and I have used it since past 12 days. 1)	If you want good photographs then don’t go for it. 2)	If you expect 4000 mah to lost for continuous 12 hrs of gaming. No it won’t. 3)	For usage of continuous dual sim, 3g network, wifi, at least 2 hrs of net surfing on wifi, 1 hour of mobile data, 1 hour of gaming and 1 hour of calls i.e. an average usage of 5-6 hrs checked through app “Quality Time” it will hold on for 24 Hrs. 4)	I was able to play Asphalt 8 without any frame drops, where as my HTC Desire 820 has intermittent frame drops. This phone beats HTC desire 820 in all features except camera performance and outward appearance. I was happy to find the mobile as per my needs as mentioned at para 1. If you have same needs as mine you can go ahead without hesitation. i am using it.i feel sound is not so good.it’s my phone problem or sound is really low for this handset? What all nice reviews we have here. Someone bought phone but not yet delivered which has become a review. Someone asking questions in reviews. This is truly a nice phone. I bought it on 22.6.15. I used wifi. It is very fast access to youtube and other sites. Go to buy Aqua Power Plus. It is worth for money.